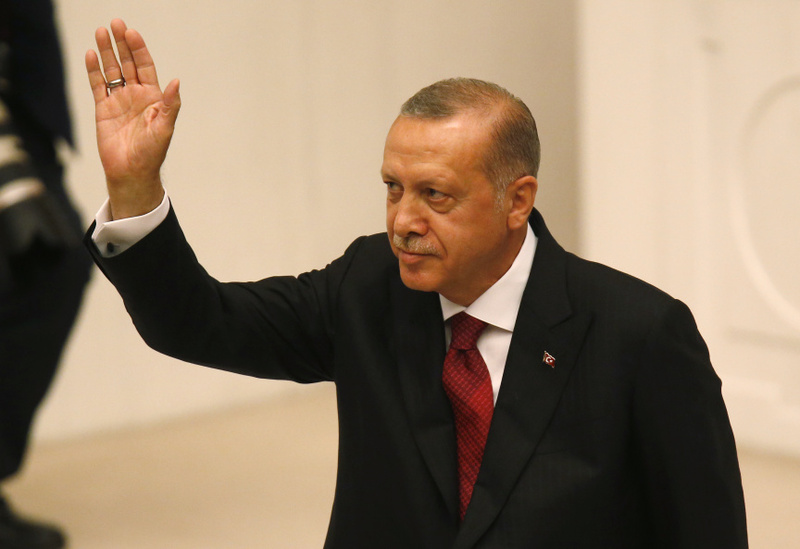 ISTANBUL (AP) — Turkish President Recep Tayyip Erdogan named the members of his new Cabinet after he was sworn in Monday under a new governing system that grants him sweeping executive powers and which critics think gives him far too much control. Mevlut Cavusoglu will remain as Turkey's foreign minister and Suleyman Soylu as the country's interior minister. The revamped 16-ministry Cabinet also includes Erdogan's son-in-law, Berat Albayrak, who will head treasury and finance as the Turkish economy shows signs of instability. The executive system of government that began with Erdogan's swearing-in scraps Turkey's parliamentary governance structure and boosts the powers of the formerly ceremonial presidency. "One of the most important democratic transformations of our country in its history has been successfully completed today," Erdogan said. Under the new system, the president forms government, appoints ministers, vice presidents and high-level bureaucrats. Previously, the prime minister —now a defunct post— formed the government by making elected members of parliament ministers. The process began in a contentious referendum last year when the executive presidency was voted in and last month's snap elections solidified Erdogan's power, which he won with 52.6 percent of the vote. The president can issue decrees, prepare the budget and has the power to impose a state of emergency. Parliament legislates, can ratify or reject his budget and the president needs parliamentary approval for emergency rule and decrees passed during that time. "Turkey is among the few countries in the world that has changed its governing system in democratic means," he said Monday. Erdogan unveiled the rebranded presidency during his inauguration at the sprawling presidential compound, saying it would bring strength, stability and efficiency to the country. He said it did away with a "system that heavily cost our country through political, social and economic chaos." Erdogan's son-in-law, who previously served as energy minister, assumes responsibility for Turkey's finances at a precarious time. The economy is experiencing high inflation, a declining currency and twin current account and budget deficits even as Erdogan insists on low interest rates. Crowds cheered Erdogan along his convoy's route as he made his way to the inauguration ceremony. The presidency tweeted with the hashtag #NewEraWithErdogan. A special one lira coin (less than 25 U.S. cents) was minted for guests with the image of the presidential palace, dated July 9, 2018. Some 50 countries were represented at the ceremony, among them controversial figures like Venezuelan President Nicolas Maduro and Sudanese President Omar al-Bashir, according to official Anadolu news agency. Major Western leaders were not in attendance. Erdogan will not only run the executive branch but also lead his Justice and Development Party in parliament where he is short of a majority and therefore allied with a nationalist party.